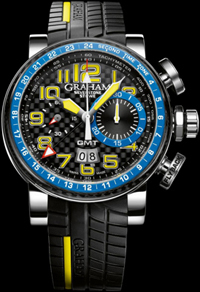 New hours of Silverstone Stowe GMT Tracklighted Graham from the company. 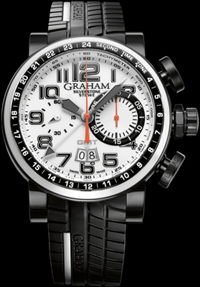 UK brand Graham, engaged in the production of Swiss watches, today announced the release of new models Silverstone Stowe GMT Tracklighted, whose body is made in two versions: stainless steel or stainless steel with a PVD-coated in black. The round body of the model, water-resistant to 100 meters, has a diameter of 48 mm. The front side of the body is equipped with a sapphire crystal with anti-reflective coating, but the glass is mounted on the back cover, tinted windows. Bezel watch is made of ceramic and graded 24-hour markup. Dial models are also released in two versions: white lacquer or black carbon. The marking on the dial is made in the form of Arabic numerals, which are also as the arrows are covered with a yellow or dark-gray fluorescent substance. Time is indexed on the face by the central hour and minute hands. Small seconds hand put to the side of the dial in the 9 o’clock position. Date of built-in dual aperture in the 6:00 position. Using a special needle is fixed by the central second time zone. Flyback-chrono functions are displayed on a 30-minute display with an orange arrow at the 3 o’clock position, and through the orange central second hand. New Silverstone Stowe GMT Tracklighted operates on Swiss automatic mechanism Graham G17212, providing 48-hour power reserve and the balance frequency 28,800 vibrations per hour. The mechanism used by 28 stones. Model Silverstone Stowe GMT Tracklighted comes to integrated into the body strap, made of black rubber with a stylized drawing road tread. Strap is decorated with white and yellow paste. Issued in a limited quantity of 250 copies, you can buy watches from authorized company representatives Graham at a price of 11,550 dollars.